Your Thermomix is fantastic for making juices & smoothies. One of the many benefits is enjoying juice that is full of fibre, because you’re using the whole fruit, rather than the juice only. This orange juice recipe is delicious, easy & so fresh! Adding the sugar in this recipe is optional. 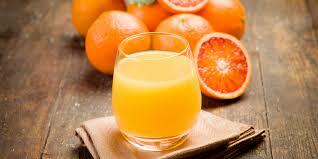 If you’re used to drinking store bought orange juice, you will need it. However, over time you can gradually reduce the amount as your tastes get used to the natural sweetness. The secret to this recipe is the water gradually being added to the TM bowl. Your Thermomix blades will emulsify the water into the orange flesh, ensuring a smooth consistency. 1) Place sugar in TM bowl & mill for 10 seconds/speed 10. 2) Add oranges & ice. Mix 20 seconds/speed 6. 3) Set timer for 1 minutes & turn on speed 9. Slowly pour water onto TM lid & it will drizzle under the MC into the bowl.